A research report on how Program Related Investments could operate in Australia is now available. 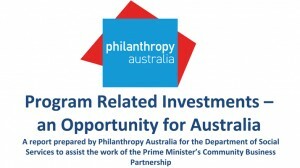 The research was commissioned by the Department of Social Services on behalf of the Prime Minister’s Community Business Partnership and undertaken by Philanthropy Australia. The recommendations of this research will be considered in the development of advice to Government by the impact investing and partnership’s working group of the Prime Minister’s Community Business Partnership. analyses the outcomes of the consultation process and recommends a model suitable for implementation in Australia.